Marketing your online interior design business is a whole different world than marketing locally. There’s all the content, the emails, the search engines to be found on- and oh yeah- social media. There’s just so much, but in this episode of The Decorettes the gals are breaking down exactly what to do to market your business and the order in which to do it. So stop feeling stressed about trying every new marketing strategy out there and learn how to market you eDesign services strategically so you can start booking clients! Designing an influential personal brand isn’t always an easy feat, especially in a world full of influencers (or people who think they’re influencers!) but it can be done! We’re chatting with Angela Mondloch, the creator behind Saffron Avenue, about how she’s built an infuencial brand that is not only profitable but built around her life and passions. Ever wonder how to use Pinterest to grow your website traffic? It's no joke that Pinterest can be a game changer when it comes to driving qualified traffic to your website while also building that know-like-trust factor, and all for free! But before you go Pinterest crazy, there are some things to keep in mind when deciding to focus on this social platform, so this week The Decorettes are interviewing Sarah Morgan of XO Sarah. She's the gal that helped Steph skyrocket her own website's traffic through Pinterest, and she's going to help all of you do the same! No more excuses- it's time to get visible in your personal brand, both online and in-person! So this week The Decorettes brought in the experts! Join us as we interview the Visibility Warriors themselves, Rachel Moriarty and Dixie Willard of the Design + Style podcast as they give us their best tips for being visible in your business, even when you don't want to! There are always so many things to do in our businesses, so this week on The Decorettes Jess and Steph are gving some content marketing tips that will help you reduce your overwhelm. This the exact method Stephanie uses to continually bust out new content, grow her email list, and book new clients. You won't want to miss it! 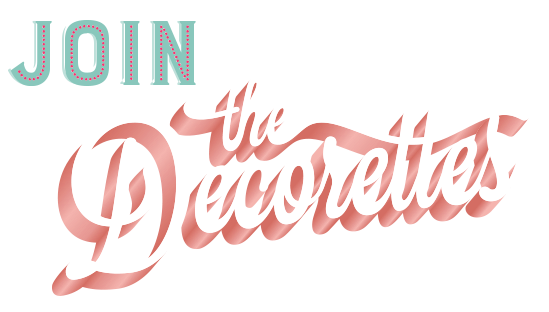 Become a member of the decorettes vip lounge! Get access to exclusive content and become a part of the swankiest community of business owners around! become a member of the vip lounge!